A relation of the router, this tool is specifically made for trimming laminates, but with various cutters it is quite a handy lightweight tool for such jobs as recessing hinges. 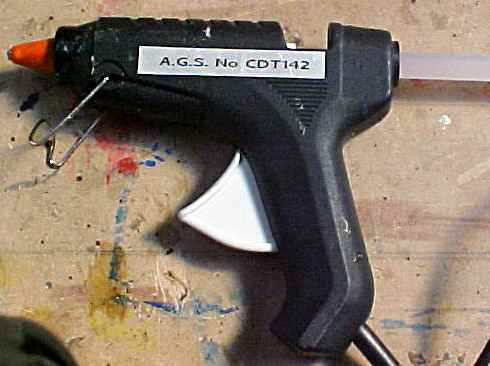 An electrical tool for heating up adhesive sticks into a liquid state for simple no fuss glue jobs. A glue that is in it'e normal state a solid or semi-solid but it becomes liquid when it is heated. For example the glue sticks used in hot glue guns. The Makita trimmer shown here is set up with a small tungsten tipped bevel cutter. The machine will trim bench top and cupboard laminate edges neatly and quickly. With other cutters installed it can do a variety of other lightweight work. The latest version of this laminate trimmer has a no load speed of 32,000rpm. The collet capacity is 6.35mm or 1/4". All the manufactures keep to these standard collet sizes and it is a good thing to. We have an enormous choice of cutters available with many of them at very good prices. As mentioned in the description. though this may sound like a tool for just the one job, that is not the case. 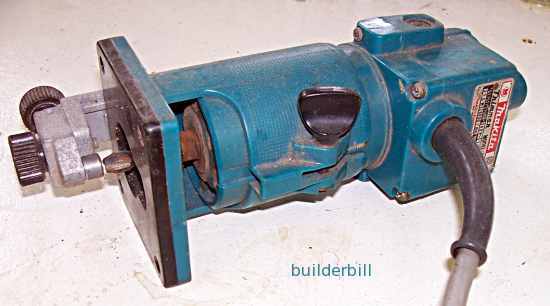 The small size and standard 1/4" collet make it very handy for many jobs that the larger routers are just to cumbersome to use on. The one above has done a fair bit of trimming in it's time, but I actually bought it for working on doors. With a small amount of time and some waste material it was easy to make up a set of jigs for recessing hinges, door lock faceplates and striker plates. The pay off is faster working, but far greater than that is the quality of the finished work. Nothing looks better than perfectly fitted door furniture with no gaps and no split edges. 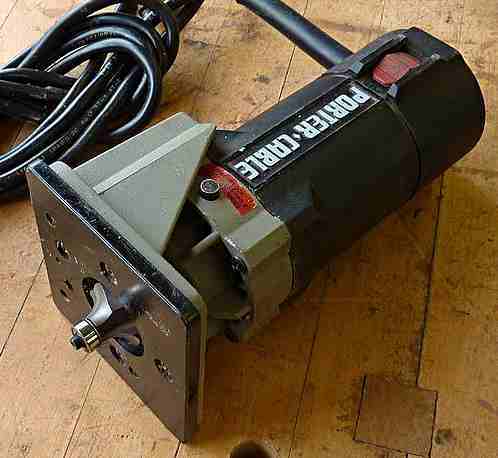 A Porter Cable laminate trimmer router. Hot Glue Guns have applications for the odd job in the construction industry. They have the advantage of not being messy, they have short setting time and they don't have a short shelf life after being opened like some products. All of these factors make them ideal for the odd emergency glue job and they are great for hobbyists. In the commercial field there is a far greater range of uses and products for this technology. 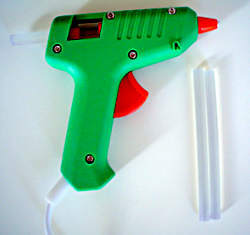 Simple and cheap guns have the glue stick fed through the enclosed heating elements by a push of the thumb by the user. Other better guns have a trigger feed much like a caulking gun. Usually the glue when it comes out is hot enough to blister the skin. For applications like making craft items with children then lower temperature sticks are used.